Instagram Message: Even though I'm totally heartbroken to lose Tom Petty, I'm going to follow the advice of a wise man and keep rocking! Taco stands for your thoughtful tacos. When the hub and I started dating, we were both vegetarian - well, technically by the time I met him, I was a pescatarian. Our first trip together was to Rosarito Beach and I was in Mexican Food Heaven. I noticed that he ordered: rice, beans and corn tortillas with a side of guacamole and no cheese on the beans. He used these side dishes to make his own rice and bean tacos. He ordered that exact meal for every meal for the whole weekend. I’ve been with him for over twenty-one years and he still eats that same meal every single week. October 4th is National Taco Day! You may think it’s just another excuse to take pictures of your food and post it on social media but National Taco Day is legit. According to nationaldaycalendar.com, National Taco Day was founded in 2009 but no one knows who created the holiday. The site claims that in 1967 Roberto L. Gomez and the National Taco Council, sent a fifty-five pound taco to President Johnson. What a thoughtful pinch! My thoughtful pinch for National Taco Day comes to you from my friends over at Dinner Doulas. Years ago, I struggled with making dinner for my family of four. I didn’t want to make too much food because the hub is not a “leftover” guy. He also wasn’t a meat, chicken, pork or fish guy either. You get my drift, I was limited for dinner ideas. The lack of options coupled with being overwhelmed (my only symptom of menopause) made dinner just that much more challenging. Hiring the Dinner Doulas saved me. No, the Dinner Doulas did not come over to cook for me. Instead they came to my house to interview me, check out how my kitchen was organized, survey my pots and pans and inspect my pantry. The appointment was incredibly helpful because I learned that my kitchen wasn’t set up in a way to make meals easily. They also provided me with 6-7 recipes that yielded the perfect amount of food and satisfied the hub’s palate. 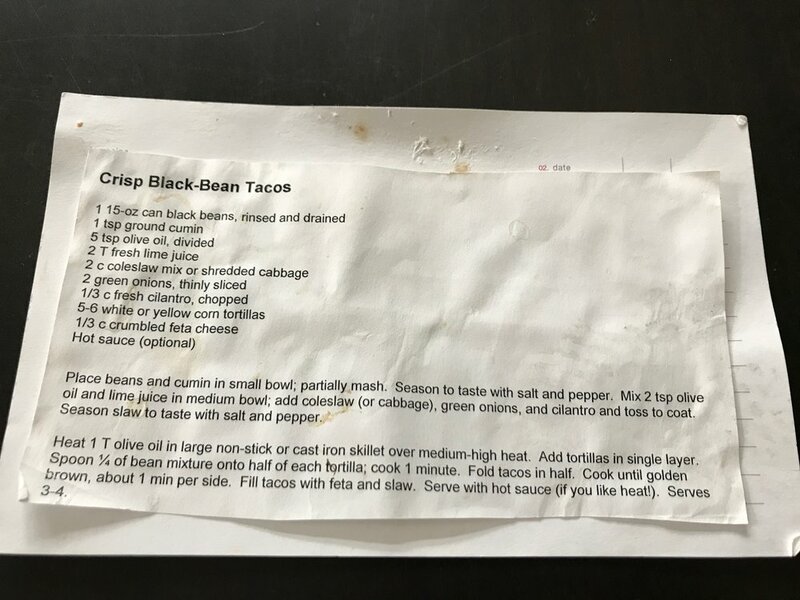 Crispy Black Beans Tacos. A recipe that can be doubled and tripled if you need to serve tacos to a lot of people. Even die-hard meat eaters will enjoy this taco. Fish Tacos - If you’re not fortunate enough (like me) to live near a Wahoo’s - then you need to do the next best thing. Learn how to make a good fish taco. Another pinch - a Dinner Doulas recipe. My first encounter with a “Walking Taco” was at a kids’ birthday party. Since the kids were so young, the parents were invited to stay and enjoy the party. For lunch they set up a taco bar complete with all the fixings to make a great taco. A crockpot full of ground beef, bowls of shredded lettuce, chopped tomatoes, shredded cheese, salsa, sour cream and guacamole. The very first item on the taco bar was a big bin of Doritos in individual bags. I fell in line, skipped the Doritos and started to look for the flour or corn tortillas. Hard shell? Soft shell? I kept looking around. No one else was asking where the tortillas were. Finally, I asked. I was told to take a bag of Doritos because they were serving Walking Tacos. Open the bag of Doritos and load it up with all the taco fixings! Genius. You can use a fork or your fingers to scoop out your taco meal. Perfect for kids of all ages. If you’re hosting a big crowd and you don’t want to cook - get the taco truck or hire the Taco Lady. So good. Thoughtfulness thru tacos may seem ordinary but nonetheless it is still thoughtful. I love that a taco shell or tortilla can be filled with anything and be called a taco. Not to mention there’s never a bad time to enjoy a taco. Have one for breakfast (has anyone tried Taco Bell’s fried egg taco? ), lunch or dinner. You can also give a taco accessory like a tortilla warmer, taco stands or taco sauce. There are plenty of taco-themed pinches out there - anyone who enjoys tacos would appreciate the thoughtfulness. Here’s hoping that your taco shells are filled with all the things you love. Don’t forget, if you’re going to take pictures of your tacos, make sure you hashtag it #nationaltacoday.